If my father was still alive he would turn 96 today. He died in 1988, about a month short of his 77th birthday. He was a big gentle man who always spoke softly. As kids, some of my fatherless friends he took special interest in to see that they didn’t get short changed in their formative years. He loved to tell long adventurous tales, making up as he went to his nieces and nephews with them sitting in his lap. He had a number of siblings, each with younger children, and an equal amount of in-laws with small children. With the way family visited each other back then, he was good for a story every weekend and some weekdays. In the stories he made up as he went he pretty much described the kids on his lap, and they became so engrossed and transfixed they felt they were the characters. Sometimes they cried. One time, one niece suddenly hit him across the face she was so upset. But normally, they were greatly entertained by those stories. Daddy also called the same kids a week or so before Christmas and they thought Santa Clause was calling them. He would talk deep and bellow out deep Ho-Ho-Ho laughs which pretty much fascinated the kids. He asked them about their behavior and what they wanted for Christmas… chances are he would bring up something that they recently got in trouble for (a little bird told him) and had them promise they wouldn’t do that again. He probably enjoyed their call from Santa more than they did. 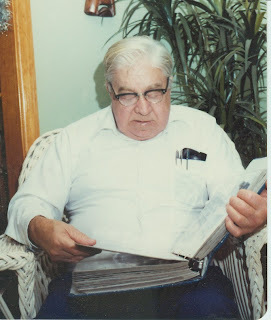 He was not a religious man most of his life, but about his last ten he was Baptized at Crestview Baptist Church in Marietta and within a year was one of the founders of the Due-West Methodist Church in West Cobb County. He also did not care for sports until about the last ten years of his life. Every one of his seven brothers loved sports – to play themselves and to follow teams, local and nationally. Daddy did not give sports that much of a thought until his later years, then he tried to watch the Braves and Falcons on TV whenever he could. There might be hope for me yet. Another thing he was very non-pretentious and very frugal. He never considered a car radio – wasted expense. He never wore tennis shoes or sneakers, never wore shorts, or a pair of pants that was not black or dark blue, and he always wore either a collar blue or white shirt…. Anything else wouldn’t be him. That's wonderful Birthday salute, Ed. He really does sound like a great guy. I bet he's missed muchly by your whole family. Don't do it! lol! My Teams drive me absolutely bonkers, I'm tellin' ya. and dont start rooting for the Falcons this year....its going to be a long one in Atlanta. My "great hope for me yet" might have been hinting that I might be a sports fan yet, or maybe live to be 76, which is only 10 years away. Yeah, I think I always pause on each of my parent's birthday day. And sometimes their death days too. I hope you live to at least 96, Eddie, and blog everyday! 96? My eyes get bloodshot just thinking about it. what a wonderful, touching story! no doubt he's a huge part of why you turned out to be such a terrific guy, ed! He was basically a good man... on the other hand, as a teenager and before I was always up to no good. I think feeling guilty is one one of the reasons I respect him.